For three generations, Kindermusik has helped millions of children around the world build a strong foundation for a lifetime of learning. [vc_row][vc_column][vc_single_image image=”8342″ img_size=”620×288″ alignment=”center”][/vc_column][/vc_row][vc_row][vc_column][vc_column_text]Ok…I’m about to tell you all something you already know…our babies, our toddlers, our kids…they feel stress! We “old” folks don’t have a monopoly on this lovely feature of the human condition. Now think about this: we are supposed to have things together by adulthood, but let’s face it, how many times do you get into a situation and look around for a more “adultier” adult than you!? We are supposed to have a developed sense of self-awareness that allows us to – hopefully – use developed coping strategies to process stress in a heathy way. Now…imagine an infant or toddler experiencing a stressful situation. Not only might the situation be new, they are still figuring out how to respond! This can compound stress in a child. No fun, right? Harumph! Don’t look at me! Positive – this is common and often short-lived. New babysitter? Perhaps a new food to try? A child might experience this type of response. Think a short rise in heart rate. Tolerable – Often the result of a loss of a loved one or perhaps experiencing something scary like breaking a bone. This can last longer than the Positove response. With an environment of supportive adult relationships, the effects of this type of stress can have a buffering impact and help a child recover. Toxic – this is longer lasting and can be a result of such awful things as neglect, abuse, or the results of economic hardship – and occurs when supportive relationships are not present. As you build the circle of positive interactions for your child, you increase the child’s ability to respond to the world, learning that these “tall people” really care, and it would seem that the earlier this occurs, the better. 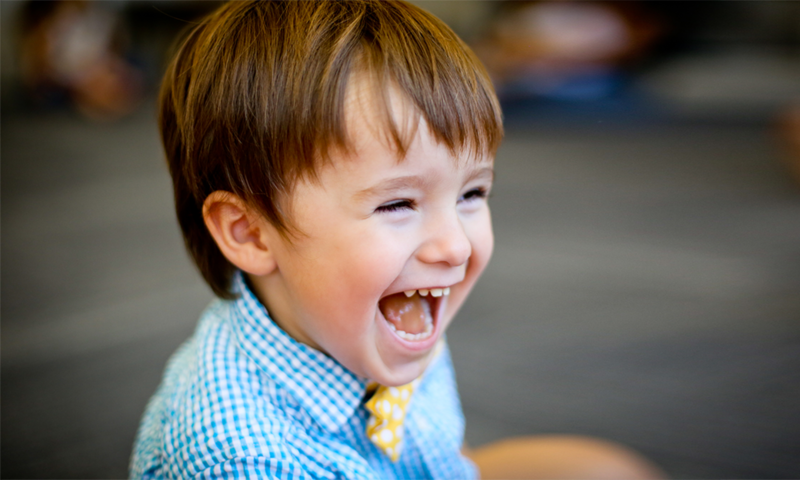 Now…think about the types of interactions that occur during Kindermusik classes. See a connection? I do! When taking part in regular group musical activities lead by a caring adult, a child’s circle of positive relationships grows. 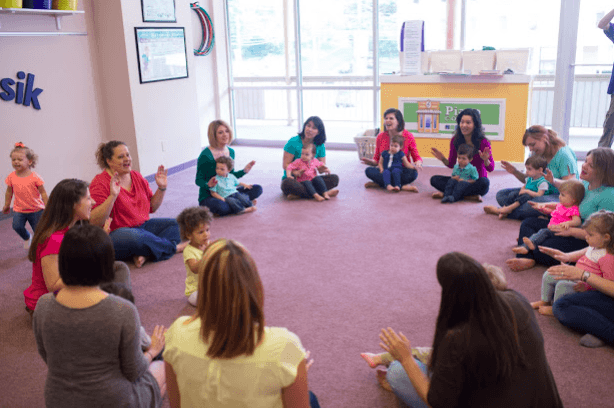 Singing together, call and response activities (a musical version of “serve and return”), and group movement, all can have a positive impact on stress levels. Did you know that groups that sing together can sync their heart beats? Crazy, right? So consider this the next time your child is overwhelmed by the world around them…and not just when they are anxious to go to bed at night…sing a song together, dance together, or get out some pots and use them as drums. You bang and then have them mimic you. Music can reduce those hormone levels, singing can control breathing, and that stress response can be brought back to a healthy place. Did you really think that you could slip in unnoticed after class already started? We had finished all the rounds of the “Hello” song and just transitioned into rhythm sticks when you and your child walked into the classroom. You held your head down trying to avoid eye contact, but your little one didn’t even think about feeling embarrassed for arriving late. Instead, she burst through the door ready to make music with her friends. As soon as you dress your infant and strap her in the carrier she experiences her first diaper explosion—the kind your BFF warned you about—and the one you didn’t believe because she tends to exaggerate. After the shock wears off, you spend the next 30 minutes cleaning up your baby, your car, and yourself. Your child refuses to get dressed in anything other than his Buzz Lightyear pajamas, except said PJs are stained with who knows what and two sizes too small. After 20 minutes of intense negotiations, you arrive at a compromise of last year’s Scooby Doo Halloween costume, which is only a slightly better option. It takes your toddler 13 minutes to walk 10 steps to the car. She keeps stopping to investigate something spectacular—a rock, an old piece of chalk left in the rain, an ant. When you attempt to spur her on down the path, it sparks an epic meltdown on full display of the elderly couple next door. After 8 minutes, your child forgets the root of her despair and happily gets in the car. Ten minutes before you need to leave for class your child FINALLY decides to take a nap. You debate letting him sleep to help ward off the evening drama guaranteed to happen on “no nap” days. You opt to shorten the nap by letting him sleep 20 minutes instead of his usual 30 minutes…which means you are 10 minutes later for class. You hope a short nap is better than no nap, but only time will tell. YOU take a nap. Hey! Parenting is EXHAUSTING…as in “will-I-ever-sleep-again exhausting.” You needed that nap because you know you will be up three times between your child’s bedtime and 630am. So, while your reason for arriving late may not be listed above, it’s okay. You are welcomed whether you show up early, on time, late, or not at all on some days. We understand. It’s why I wasn’t the only one who noticed you arriving late. The other parents did, too. We all widened the circle to include you. After all, we are a family and that’s what family does. Do you want to join a community of other families who understand what it’s like to be a parent today? Find a class near you! Contributed by Lisa Camino Rowell, a freelance writer in the Atlanta area. Through the years, she arrived late countless times to Kindermusik class (for all of the reasons listed above). 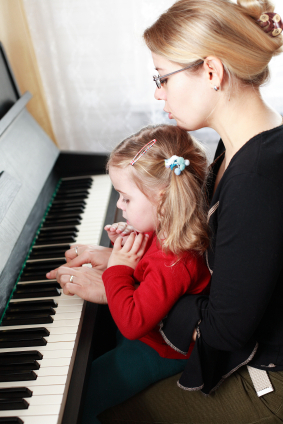 Are you raising a musical family? If you find yourself relating to this list, then chances are the answer is Yes! Your toddler thinks you’ve been hiding white egg shakers in the refrigerator and can’t understand why he can’t play with them, too. Your kids yell at YOU to turn the music down. 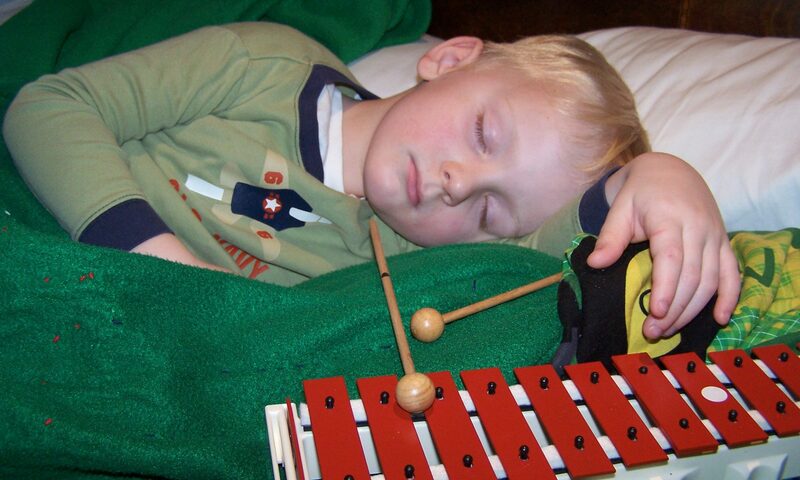 Your child insists on sleeping with his favorite instrument. Your child sang her first words. Your child insists you sing “Wishy-washy-wishy-washy-wishy-washy-WEEEE” during every bath. Pinecone + stick = guiro. Your child can turn anything into an instrument. Your child knows what an album is. You’ve recorded at least one video of your family lip-synching a song from Frozen. You re-enact the dance moves from Dancing with the Stars or So You Think You Can Dance. Yes, even the lifts. You thought about how many kids you wanted based on the size of your dream band. Your family’s musical tastes range from Taylor Swift to the Beatles to Tchaikovsky to Miles Davis to KidzBop. Your child insists on answering your questions through song. You have at one point either tried out for American Idol (or your country’s equivalent) or the Voice OR secretly imagined your child auditioning one day. You dressed (or dress) your child in any of the following: vintage concert T-Shirts, “I’m With the Band” onesies, “Treble Maker” bibs, or Future (insert instrument of choice) Player pullovers. Do you like to hang out with other musical families? Find a local Kindermusik class and meet other parents who place a high value on raising musical kids! Contributed by Lisa Camino Rowell, a freelance writer in the Atlanta area. She wakes up every morning to the sounds of her husband singing, dresses her kids in vintage concert shirts, and tripped over more than one glockenspiel. Why Should I Spend Money on a Toddler Music Class When We Can Just Listen to Music at Home? However, for young children to receive the maximum benefits of participating in learning (and playing!) through music, they need music at home and in a class group environment. Children thrive on both. In fact, research even shows that engagement, consistency, and longevity of participating in music classes directly correlate with the language, literacy, and other cognitive benefits of music. Learning in a group of peers, regardless of age, is different than learning by yourself—or with your child at home. Also, each group is unique from the next because each group is comprised of different individuals contributing to the group. 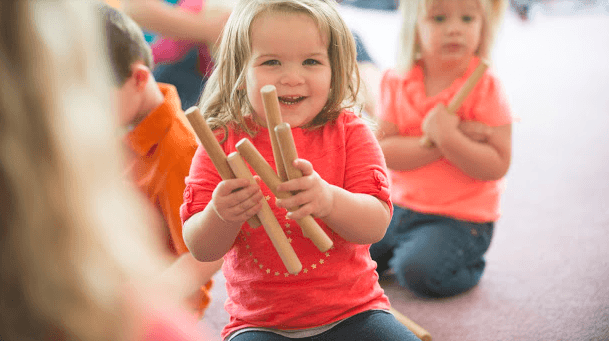 In music classes for young children, like Kindermusik, we intentionally create a learning environment where every participant contributes and takes away something unique based on their own experiences, both inside and outside the classroom. Parents notice this right away when each child can choose to sing, wave, jump, or even blink hello to their friends during the very first song. 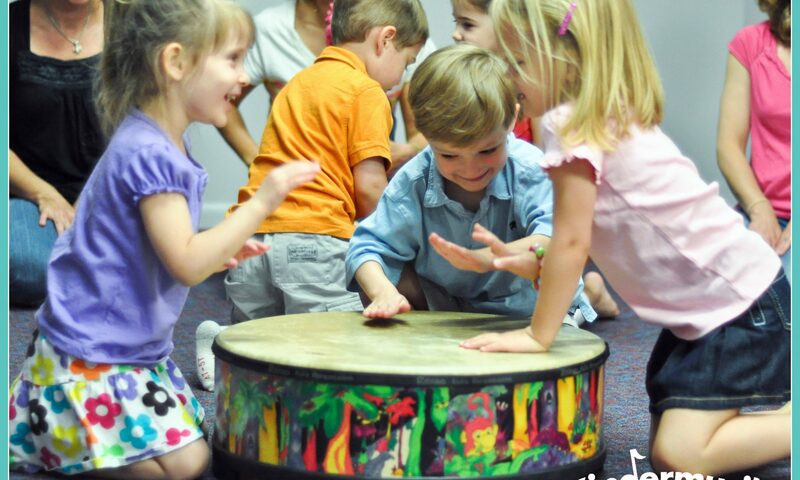 This experiential environment where the learning process is shared by everyone in the group—including children, parents, and the teacher—is called “social constructivism.” For example, in each class a Kindermusik educator guides the class towards a learning objective, such as steady beat, timbre, or vocal play, with children as active participants in the learning process. Providing children with ample time to reflect, compare, make choices, express opinions and preferences, and engage in problem-solving activities together teaches children not only the lesson focus but it teaches them how to learn. Children participate, collaborate, and contribute to the process in a group learning environment. So, while the lesson plan is repeated in classrooms around the world, the experience is slightly different based on each individual group. So, yes, “playing music” at home matters, but so does “playing music” in a group. Children need both to fully experience the life-altering benefits of music education. Oh and by the way: Participating in a music class benefits parents, too. After all, parents make connections with other families in the same season of life. As parents, we can all use a group of friends who understand the unique challenges of potty training, sleeping through the night, healthy snack choices, best parks for a 2-year-old AND a five-year-old, and even which consignment or second-hand sales are worth attending. Want to “play music” in a classroom with other families? 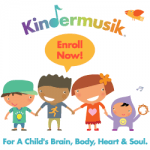 Find a local Kindermusik educator! Contributed by Lisa Camino Rowell, a freelance writer in the Atlanta, Georgia, area. At the beginning of January, we often reflect on the passing of another year. For parents, that might mean celebrating all of those “firsts” that happened last year like a baby’s first steps, a little one’s first time sleeping through the night, or maybe that first tooth (or first lost tooth!). In the life of a young child, so many firsts happen in one year! For early childhood teachers, it might mean celebrating how much your students have grown in confidence and abilities. 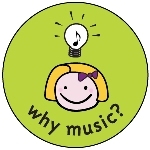 For us at Kindermusik, we also like to look back at all of the amazing new music research published in the last 12 months that helps answer the question, “Why Music?” After all, we recognize how music really does give children a good beginning that never ends. We invite you to travel with us down Abbey Road Memory Lane as we highlight 11 of our favorite blog posts from 2014, including new research about the power of music. Want to see these blog posts in action? 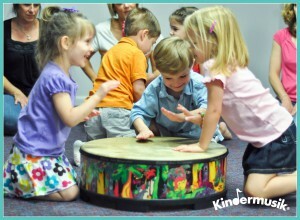 Contact your local Kindermusik educator at www.Kindermusik.com and come visit a class. Contributed by Lisa Camino Rowell. A freelance writer living in the Atlanta area. Have you ever sat in a movie theater, and several people in the row behind you are all talking? I bet you found it difficult to concentrate on the movie. Although we highly encourage you to talk to your child throughout the day and label movements, sounds, and objects to help with language acquisition, there are times when we have to allow them to figure out what to do without being told. Allow them to problem solve. I want to share with you an experiment we did in a few of my classes. I asked the adults not to give directions to their child during this class – just sing when it was appropriate in the lesson. The toughest part was the “no talking”. But they all agreed and were curious to witness their child in this somewhat altered environment. I encouraged them to guide their little one by being a model and using non-verbal cues. Try a version of this experiment at home. Take time to explore with your child without giving them opinions or directions. Be a model for them through your actions and not your words. It’s not easy, but it may allow you to be “in the moment” with your child in a way you have not been before. 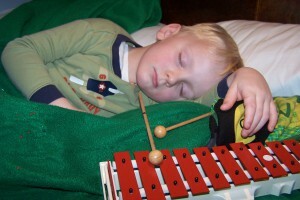 Special thanks to Kindermusik educator Cathy Huser for sharing this insightful post from her blog. Cathy’s program, Kindermusik of Cleveland, has been a top ten Kindermusik Maestro program for 10 years running. This post was shared with Minds on Music from Kindermusik educator Analiisa Reichlin. I sat at the dining room table with my head in my arms and just sobbed. Our studio email accounts had disappeared, our website was being migrated from a very slow, old server to a new one, and the ½ hour project turned into a week-long nightmare, and the site was down during our busiest time of the year. Our dog Buddy had been bitten or stung by something, and had gone into anaphylactic shock. In addition, after 3 years of deals falling through at the last moment, we were just about to put an offer in on a house. But that was before the unexpected expenses that wiped our savings out. I found myself frequently bursting into song this week. And of all the odd things – hymns from my childhood. There was something comforting about them. I began wonder why. Years later I asked [my Kindermusik partner] Miss Allison (with her degree in musical theater), why do they burst into song? And she said that the character has reached the point where the emotional intensity of the moment can no longer be conveyed with words. So this week, when I ran out of words, I found myself singing. But why the hymns? Certainly because the words brought me comfort. But also because when I sang them, I was brought back to the time when I was young, surrounded by my family, in a moment when I felt very loved, and at peace. Where I needed to be emotionally this week. 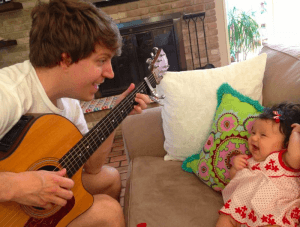 I got to thinking…What songs did I sing to my babies, and now with my children? Because those are the songs that they are going to sing when they are grown up and need to remember the emotional security and comfort of those who loved them best. -by Miss Analiisa, who knows that the math formulas she teaches her children may not be remembered when they are older, but the music and songs she instills in them will be in their memories forever. What can your child learn from a puddle? What would it be like to walk through a puddle for the first time? To not notice it coming up and then just hear the rhythm of your walk change from a tap tap tap to splish splish splash? . . . You look down and notice you are standing in water. You see it, consider it, feel it. What an adventure of the senses! Parents know how lucky they are to see this happen right before their eyes: their child discovering something new – something that has a sound, or a feeling, or shines, or moves. Discovery can be an incredible gift. 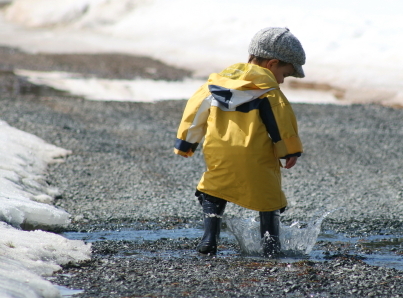 By letting your child walk through that puddle, millions (maybe billions) of sensory connections are made. Thought patterns, optical pathways, auditory stimulation, and your child’s perception of the world are altered and strengthened. Embrace what a difference you make for your child by taking those walks that last a long long time but cover very little ground. Remember, every stone, pine cone, ant, bird, leaf, and puddle holds a world of discovery. Don’t miss it! Don’t worry about the puddle – the shoes will dry and the pants can be cleaned. The work of the child is to experience something new every day, and that’s one of the best ways you can help your kids learn and grow. 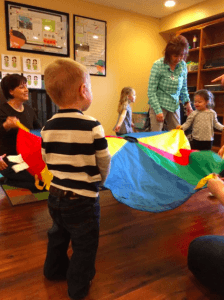 -This post was contributed by Kindermusik educator Helen Peterson. 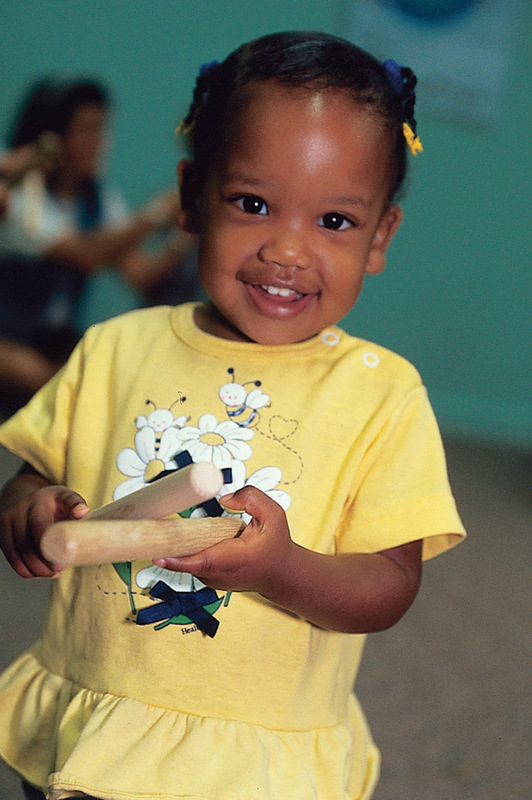 Helen’s Southern Twin Cities program, Kindermusik of the Valley, is in the top 1% of Kindermusik programs around the world. Relaxation is something we all search for, yet we don’t always find time for it. Life can be stressful and fast-paced, and it’s often difficult to find time to let our bodies and minds relax. Sometimes even when we’re “relaxing” we’re thinking about what’s next on the to-do list! 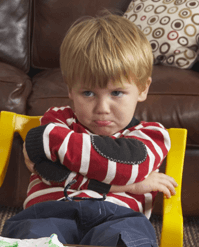 If you notice some sudden changes in your child’s behavior, stress could be a factor. You may ask what on earth could they be stressed about? After all, they don’t have any bills to pay! 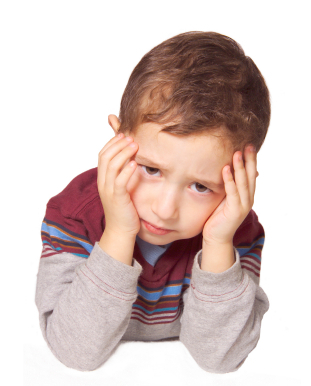 Children tend to experience stress in new situations, when changes happen, or when they are confronted with challenges that require new skills. These might include learning to play with a new toy, learning to share with a sibling, making new friends, completing a project, and so on. The goal is simple: make your kids feel good. When they feel good, you feel good! What other activities can we do with our children to help them manage stress? Post an idea in the comments area below. Special thanks to Kindermusik educator Vanessa Cabrera for sharing this post from her Language, Music & More blog. Information about Vanessa’s Maryland Kindermusik program can be found at her blog. Categories Select Category Activities for Kids Book Review Cognition Creative Early Childhood Education Educator Spotlight ELL – English Language Learners Family Fun Inspiration Intergenerational Interview Kindermusik Language & Literacy Math & Logic Mommy Blog Movement Music Music and Health Music and the Brain Parent Perspective Parenting Tips Physical Power of Music Research Review Science Center Stage Social & Emotional Stress Sustainability Teach Kindermusik Technology Uncategorized Why Kindermusik?